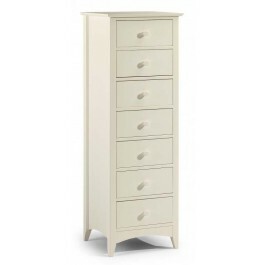 Shaker style tall narrow chest with 7 drawersand a Stone White lacquered finish. A perfect storage solution for confined bedrooms. Shaker style tall narrow chest with 7 drawers and a Stone White lacquered finish. A perfect storage solution for confined bedrooms.